Serge, Alexis, Isabelle, David and Nina were the five children of General Zakaria Mdivani (1867-1933), a former aide-de-camp of the Emperor Nicholas of Russia, and his wife, Elisabeth Viktorovna Sabalevska. They were collectively known as the "Marrying Mdivanis", as they all succeeded in marrying money and fame. The family fled to Paris in 1923 when the Bolsheviks invaded Georgia, and apparently settled in a château near Versailles before moving to the United States, where they exploited their good looks and (fraudulous) princely titles to the full. 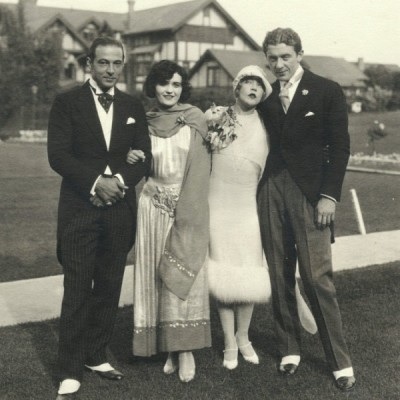 Serge Mdivani (1903-1936) married actress Pola Negri (1897-1987), in 1927. Negri was a world-famous actress and had had love affairs with Charlie Chaplin and Rudolph Valentino, but when she lost her fortune in the Stock Market Crash of 1929, Serge abandoned her and took up with opera singer Mary McCormic (1889-1981), one of the most famous sopranos of the 1920s and 1930s. She later divorced him in a highly publicized trial. 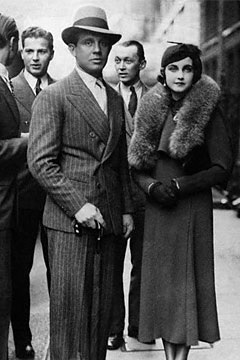 In 1936, he married his former sister-in-law, Louise Astor Van Alen Mdivani (1910-1997; she had been his brother Alexei's wife from 1931 to 1932), but Serge died later that year in a polo accident in Florida. 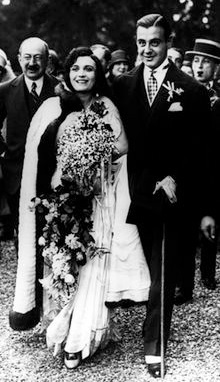 Alexis Mdivani (1905-1935) married Louise Astor Van Alen, a member of the Astor family, in 1931, but divorced her a year later (she married his brother Serge in 1936). Alexis then married Woolworth heiress Barbara Hutton (1912-1979), one of the world's richest women at the time, before divorcing her in 1935 and becoming involved with Salvador Dali's lover, 26-year-old Else Zarske, the divorced second wife of Heinrich Baron Thyssen-Bornemisza de Kászon. Later that year, Alexis died at the wheel of his Rolls Royce near Mas Juny in Spain, aged only 30. David Mdivani (1907-1984) married actress Mae Murray (1885-1965), a star of the silent screen, with whom he had a son, Koran David (1927-). David became her manager, and essentially destroyed her career by advising her to leave her contract with MGM. When he later bankrupted her, she divorced him in 1933, and they became involved in a fierce custody battle over their child. David then became involved with French actress, singer and model Arletty (1898-1992) before marrying Sinclair Oil heiress Virginia Sinclair (daughter of Harry Ford Sinclair) in 1944, with whom he had a son, Michael (1945-1990). David died in Los Angeles in 1984, having apparently talked of Arletty to the last. Isabelle Roussadana Mdivani (1906-1938), aka Roussie or Roussy. 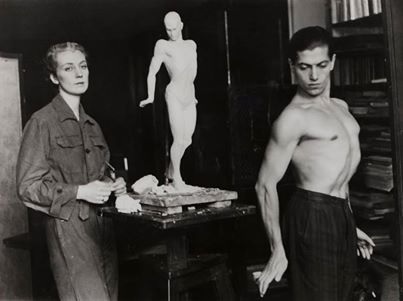 A sculptor, she married Josep Maria Sert (1874-1945), a Catalan Spanish muralist, the son of an affluent textile industry family and friend of Salvador Dalí, in 1928. She met Sert through her brother Alexis, who was a close friend of Dalí and his lover, Else Zarske (see above). She died ten years later in a hospital in Lausanne, aged only 32. 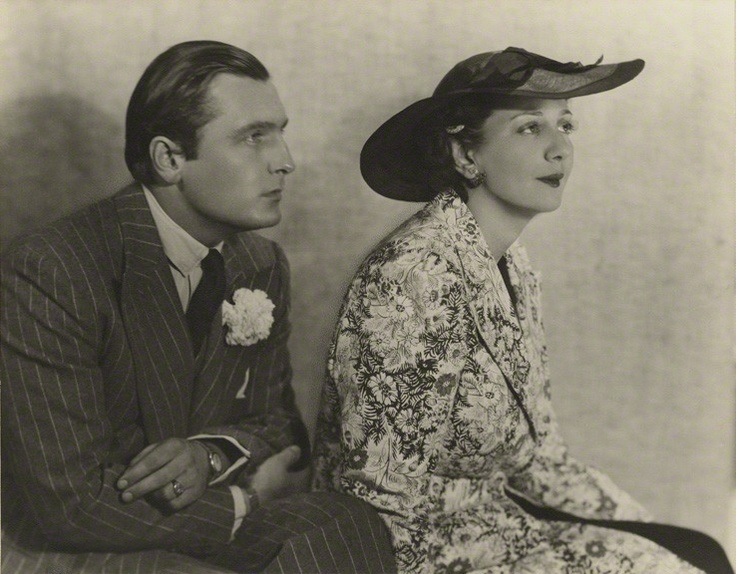 Nina Mdivani (died 1987) was married to international lawyer Charles Huberich from 1925 to 1936, then wed Dennis Conan Doyle, a son of Arthur Conan Doyle, the creator of Sherlock Holmes. After his death, Nina married his secretary, Anthony Harwood, and she became concerned that the Conan Doyle literary estate was being badly run. Eventually, after a number of lawsuits between them, she bought out Conan Doyle’s widow Jean, his daughter, Jean, and Anna, the widow of his son Adrian, with a loan from the Royal Bank of Scotland, creating an Isle of Man corporation called Baskerville Investments. Literary agent Jonathan Clowes then went on to restore the income of the estate, but Nina and her husband quickly burned through the money without bothering to repay the bank. Baskerville went into receivership and was bought by Lady Etelka Duncan. The Conan-Doyle literary estate is still administered by Lady Duncan’s daughter, Andrea Milos-Plunket. 13 April '49: sues Louise Van Alen Mdivani Saunderson, widow of his brothers Serge and Alexis, in Los Angeles alleging she defrauded him of a $1,000,000 part of the brother's estate. He claims she and her attorney, Edna Covert Plummer, convinced him that the two and one half shares of stock he was willed from the American-Naphtha Oil Corporation were worthless. 23 May '55: is sued in Los Angeles Superior Court by El Rancho, Inc., operator of the El Rancho Hotel in Las Vegas, which claims that a $3,000 check written by him bounced. It is asserted in the legal action that on June 25, 1954, David presented the check, drawn on the Chase National Bank of New York and made out to "cash,” to the hotel. The suit says the check was returned for "insufficient funds." Late November '59: files a million dollar suit in Tucson, Arizona, charging that Virginia Kent Catherwood of Tucson alienated the affections of his estranged wife, luring her away by lavishing her with expensive gifts. Catherwood, asked to comment on the suit, declares she has "nothing to say to anyone." His wife cannot be reached for comment.